I hope you all had a good Christmas. I feel slightly heavier for it and it's not over yet. Cryptozoologically, I had one experience of an out-of-place animal. The turkey I ordered was one size too big - it shouldn't have been there. That's an official bona fide sighting. Anyway, it is nearly the end of the year and a good time to look back at what has made Loch Ness Monster news nationally and internationally as well as a personal view of the perennial mystery of Loch Ness. The first thing to say is how quiet things have been at Loch Ness in 2012 compared to the previous year. In 2011, we had the Rowe and Jobes photos, the Atkinson sonar contact and various sightings such as the Hargreaves/MacGruer head-neck sighting. In fact, perhaps because it was quiet, the Atkinson sonar story was rerun again in 2012! But this year only one story hit the media headlines both nationally and internationally and that was the George Edwards photograph. The fact that this picture turned out to be a fake leaves us with a fairly echoing void as far as the media is concerned. 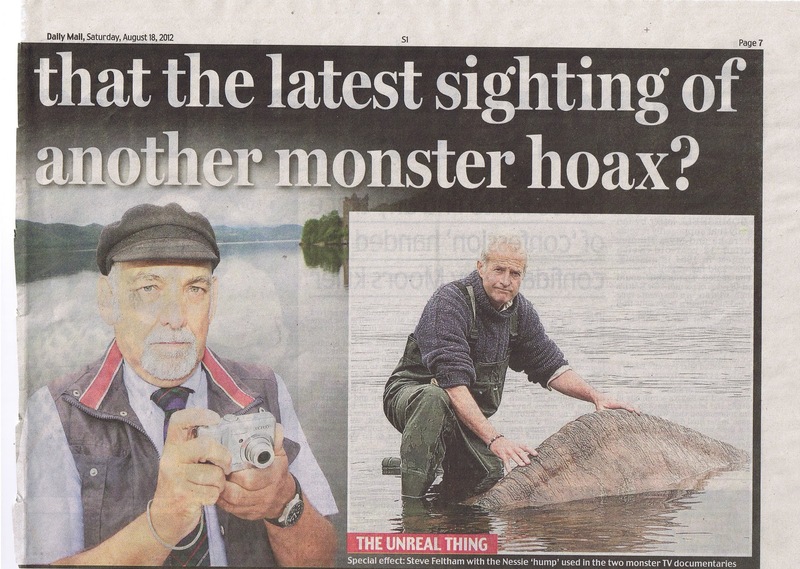 As a result, any alleged Loch Ness reports have to come in under the radar of "normal" reporting. The first report came via Gary Campbell and was covered on this blog here. The witness reported a strange whirlpool in the area just south of Urquhart Castle on April 4th. Despite the witness saying there was no boat traffic in the area, one Loch Ness researcher suggested it was just one of the cruise boats doing a circular turn. A while later when I was at Loch Ness I watched one of these craft doing a turn. The water disturbance created died down pretty quickly and the boat did not get out of sight quickly enough to fool me or anyone. Strangely enough, another potential witness of the webcam variety emailed me with his sequence of webcam shots taken the next day. That event was reported in this blog article. Now, normally such images are inconclusive at best but this one had the advantage of being animatable plus the object in the sequence appears to change shape (see below). I speculated whether this was due to the changing front portion submerging and resurfacing or some trick of the light. It was suggested by the same Loch Ness researcher that this was due to this being a two-tone boat. However, the snapshots do not really suggest this and the sun at the time was to the right and mostly behind the observer and object. Once again, make your own judgement. No, I am very sorry but I cannot breach their confidence in any way. Neither had ever believed in the “Monster” but like many others, myself included, let folk get on with the matter. They are retired ladies but have been close friends since childhood and meet up from time to time to take a walk. They had parked at Dores Pub and gone down the path in the direction of Aldourie Castle. It was on their way back that they saw this object maybe 200 yds from shore but then it just submerged ... there is no way that this pair want any publicity. I also have a new sighting report from 2010 but again getting details, let alone anyone to name themselves, is not easy at all. This blog will respect people's anonymity 100 percent but I can't force people in these situations. The thread running through these these reports is anonymity. The current trend of demythologising Loch Ness Monster reports into logs, dogs, boats and goats creates a negative feedback loop where witnesses feel foolish going public with something they think is out of the ordinary but fear getting a far from sympathetic hearing. The negative feedback circle completes when the absence of such reports is taken to be proof that people are now more properly educated and not as easily fooled by such everyday objects. Far from it, I would suggest. That brings me to the one big story of 2012 and that was George Edwards. That event was covered in my two posts here and here. However, you won't see it listed in my recent sightings page as it is most certainly a hoax. Long time monster hunter, Steve Feltham was alerted to this when a local told him that the hump in the photo looked like the one used in a Nessie documentary a few years back. This fibreglass prop was traced and the expose was complete as Steve went public with the prop. George to this day denies it is a hoax but the fact that he is also accused of another hoax photograph years before plus it was his boat that hosted the fibreglass hump documentary does not help his case at all. On top of these lochside stories, we had some interesting "offsite" ones like some people claiming that Nessie disproves evolution. Well, I thought about that at the time, but it would help to identify Nessie first before jumping to conclusions! The Olympic Torch also crossed it way up Loch Ness prior to a very successful Games in London and the TV camera typically went offline, just in case Nessie appeared. Also, the most famous painting of Nessie came to light and sold for £4,750. From a personal point of view, I made several trips to the loch in 2012 conducting various hunts and following up on monster cases both old and new. One such trip report can be found here. 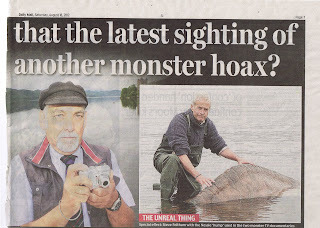 Visits to such famous locations as the Lachlan Stuart and Hugh Gray photographs were made as well as using trap cameras and night vision equipment in the more modern hunt for the Loch Ness Monster. This blog has also gone from strength to strength thanks to your visits. To gauge how much the message of the real mystery of the Loch Ness Monster is getting out there, I normally do a search for the phrase "Loch Ness Monster" on Google's search engine. Currently, this blog tends to sit around midway on the first page of hits which is great and this means that the sceptical sites are not getting it all their own way when people look for Nessie information on the Internet. In regards to the Edwards photo, the blog even got at least as high as third spot in August as people looked for more information on this outwardly intriguing picture. Whether this was a good thing or not is arguable. They say all publicity is good publicity but in this case I am not so sure. Looking ahead to 2013, we enter the 80th year of the phenomenon known as the Loch Ness Monster (though it was seen and known centuries before under other names). We cannot say what will turn up in terms of sightings, photographs or films. I can only hope for the umpteenth time that next year will bring forth that final, conclusive evidence but you may not be surprised that my optimism is very much tempered by past experience. However, with such CGI clips as this recent fake eagle trying to kidnap a toddler, one wonders how often the mantra "That's CGI, that's CGI, that's CGI, ..." will be chanted from now on when a half decent Nessie footage appears next? I am hoping that Paul Harrison will publish his new book on Frank Searle in 2013, based on interviews with Frank in Fleetwood about ten years ago. There is also one other event coming up, but more on that later. As far as this blog is concerned for next year, I have a growing list of subject titles for articles and that number is sixty just now. Since this does not include articles on as yet unforeseen events or whatever else may spring into my mind over the next twelve months, I would like to think the blog is well stocked for material in 2013 and beyond. Expect analysis and opinion on a wide range of subjects both old and new. So I thank readers - be they sceptical, believing or undecided - for their custom and wish you all a prosperous and happy 2013.